Can the Seahawks turn it around? Osi Umenyiora runs the rule over the Seattle Seahawks who, last season were an interception away from winning the Superbowl, but may this year miss out on the playoffs altogether. The Seahawks were beaten 39-32 by NFC West rivals Arizona and are now an unconvincing 4-5 for the season. 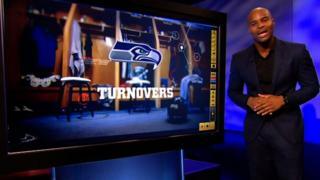 Two-time Superbowl winner Umenyiora says highlights turnovers as the key ingredient for Pete Carroll's team to turn things around.